Denzel Valentine | SG, Michigan StateHeight: 6-5 Weight: 220Yeah there are the knee questions about Valentine. Maybe he won’t be valuable after a certain while due to injury. But even if the knees eventually do give out-no certain bet- Valentine will be terrific in Fred Hoiberg’s offense as a wing that can move the ball and shoot it at a high level from deep. He’ll also help the team transition from the Derrick Rose era due to his ability to create looks for others. The Bulls announced today that the team has acquired center Robin Lopez, guard Jose Calderon, and guard Jerian Grant from the New York Knicks in exchange for guard Derrick Rose, guard Justin Holiday and Chicago’s second-round selection in the 2017 NBA Draft. Rose (6-3, 200) was a first-overall selection by the Bulls in the 2008 NBA Draft. During his time in Chicago, he earned many accolades, including being named an NBA All Star three times in 2010, 2011 and 2012, and the league MVP in 2010-11 – a season in which he was also voted First Team All-NBA. Rose was the 2008-09 Rookie of the Year and was named to the 2008-09 All-Rookie First Team. He was also a McDonald’s All-American in 2007. “Knowing Derrick as I do makes this trade a hard one. Everyone knows him as the local kid who became MVP for his hometown team, but not everyone got to know him like I did. While he is a terrific basketball player, he is an even better person with a tremendous heart,” said Chicago Bulls Chairman Jerry Reinsdorf. “I wish him the best of health for the remainder of his career, and I want to personally thank him for everything that he did on the court and in the community during his time with the Chicago Bulls.” In 2015-16, Rose played in 66 games (66 starts) – his most since appearing in 81 games (81 starts) in his MVP year five seasons ago. Rose posted 16.4 ppg (third on the team), 3.4 rpg and 4.7 apg (second on the team) in 31.8 mpg (tied for second on the team) last season while shooting .427 from the field. He led the team in scoring 17 times, in rebounding once, and in assists 27 times. Rose averaged 19.7 ppg, 3.7 rpg and 6.2 apg in 35.0 mpg during his 406 total regular season games in a Bulls uniform (405 starts). He participated in five postseasons and posted 23.7 ppg, 4.8 rpg, 7.1 apg and 40.6 mpg through 41 playoff games (41 starts). Rose finished his career in Chicago ranked 10th on the Bulls’ all-time career leaders list for points (8,001), seventh in scoring average (19.7), ninth in 3-point field goals made (350), fifth in assists (2,516) and third in assists per game (6.2). “We will always be grateful to Derrick. He was a great teammate who put winning first, and nobody fought harder through injuries and disappointment. He wowed us all when he was on the floor and at his best. His MVP season was one for the ages. We wish Derrick nothing but the best moving forward,” said Chicago Bulls General Manager Gar Forman. Holiday (6-6, 185) came to the Bulls last season in a trade with the Atlanta Hawks. Prior to 2015-16, he had also played for Philadelphia (2012-13) and Golden State (2014-15). He did not play in the NBA in 2013-14. Holiday made appearances in 53 games (5 starts) last season for the Bulls and Hawks, posting 4.5 ppg, 1.7 rpg and 1.1 apg in 14.6 mpg. His career stats include 121 games played (9 starts) with averages of 4.4 ppg, 1.5 rpg and 1.0 apg. He has made the playoffs once in his career, with Golden State’s championship-winning squad in 2014-15. Holiday contributed 9.8 ppg, 3.3 rpg and 3.3 apg in 11.0 mpg through five of those postseason games (0 starts). “As we said at the end of last season, we are committed to exploring every option to improve this team,” said Forman. “This trade is a significant step in that process. Our goal is to get younger and more athletic, and this trade moves us in that direction and allows us to start changing the structure of our team. In Robin Lopez, we are acquiring a starting center who is a good defender, good rebounder, and brings a toughness to our team. Jose Calderon is a proven veteran who can run an offense and knock down threes. Jerian Grant was high on our draft board last year as someone with a great skill set and positional size. All three players are great teammates and have tremendous work ethic, and we are excited to welcome them to the Chicago Bulls organization.” Lopez (7-0, 255) is an eight-year veteran of the NBA who has played for Phoenix (2008-12), New Orleans (2012-13), Portland (2013-15) and the Knicks (2015-16). Last season with New York, he started all 82 games and posted 10.3 ppg, 7.3 rpg, 1.57 bpg and 1.4 apg in 27.1 mpg. He shot .539 from the field (ninth in the NBA) and .795 from the line. He also ranked second in the league in offensive rebounds (268) and ninth in blocks (129). Lopez owns career averages of 8.5 ppg, 5.4 rpg and 1.2 bpg. He has been in the playoffs three times – once with Phoenix (2010) and twice with Portland (2014, 2015) – and posted 8.3 ppg, 6.7 rpg and 1.2 bpg in 26.7 mpg through 22 games (22 starts). Calderon (6-3, 200) has played in the NBA for 11 years with stops at Toronto (2005-part of 2013), Detroit (part of 2012-13), Dallas (2013-14) and New York (2014-16). Through 72 games last season (72 starts), he posted 7.6 ppg, 3.2 rpg and 4.2 apg in 28.1 mpg. The native Spaniard shot .459 from the field and .414 from beyond the arc (tied for ninth in the league). Over his career, Calderon has averaged 9.9 ppg, 2.6 rpg and 6.5 apg. He has made appearances in 18 postseason games (8 starts) with Toronto (2007, 2008) and Dallas (2014), and posted 11.6 ppg, 2.1 rpg and 5.4 apg in 25.4 mpg through those contests. Grant (6-4, 198) was selected 19th overall in the 2015 NBA Draft, with the pick originally owned by the Washington Wizards and subsequently traded to New York via Atlanta. In his rookie year, Grant played in 76 games (6 starts) and posted 5.6 ppg, 1.9 rpg and 2.3 apg (eighth among rookies) in 16.6 mpg. His .780 field goal percentage ranked sixth among rookies. Grant is the nephew of Horace Grant, son of Harvey Grant and brother of Jerami Grant, who all played in the NBA. In his final year at Notre Dame in 2014-15, Grant earned NCAA First Team All-America honors from The Associated Press. Right wing Patrick Kane of the Chicago Blackhawks has won the Hart Memorial Trophy, awarded “to the player adjudged to be the most valuable to his team,” as selected by the Professional Hockey Writers Association. Kane received 121 first-place votes and appeared on each of the 150 ballots cast for 1,395 points. Pittsburgh Penguins center Sidney Crosby, named on 145 ballots including 11 first-place tallies, finished second in voting with 800 points, followed by Dallas Stars left wing Jamie Benn (637). Kane posted career highs in goals (46), assists (60) and points (106) to capture the Art Ross Trophy and power the Blackhawks to their eighth straight playoff appearance. The Buffalo, N.Y., native notched at least one point in 64 of his 82 contests (78.0%), highlighted by a 26-game streak Oct. 17 – Dec. 13 (16-24—40) – a franchise record, the longest by a U.S.-born player in NHL history and the longest by any player since 1992-93 (Mats Sundin: 30). Kane, who became the first U.S.-born player in League history to win the scoring title, is Chicago’s first Hart Trophy winner since 1967-68 (Stan Mikita). Year Winner Runner-up 2016 Patrick Kane, Chi. Sidney Crosby, Pit. 2015 Carey Price, Mtl. Alex Ovechkin, Wsh. 2014 Sidney Crosby, Pit. Ryan Getzlaf, Ana. 2013 Alex Ovechkin, Wsh. Sidney Crosby, Pit. 2012 Evgeni Malkin, Pit. Steven Stamkos, T.B. 2011 Corey Perry, Ana. Daniel Sedin, Van. 2010 Henrik Sedin, Van. Alex Ovechkin, Wsh. 2009 Alex Ovechkin, Wsh. Evgeni Malkin, Pit. 2008 Alex Ovechkin, Wsh. Evgeni Malkin, Pit. 2007 Sidney Crosby, Pit. Roberto Luongo, Van. 2006 Joe Thornton, S.J. Jaromir Jagr, NYR 2004 Martin St. Louis, T.B. Jarome Iginla, Cgy. 2003 Peter Forsberg, Col. Markus Naslund, Van. 2002 Jose Theodore, Mtl. Jarome Iginla, Cgy. 2001 Joe Sakic, Col. Mario Lemieux, Pit. 2000 Chris Pronger, St.L Jaromir Jagr, Pit. 1999 Jaromir Jagr, Pit. Alexei Yashin, Ott. 1998 Dominik Hasek, Buf. Jaromir Jagr, Pit. 1997 Dominik Hasek, Buf. Paul Kariya, Ana. 1996 Mario Lemieux, Pit. Mark Messier, NYR 1995 Eric Lindros, Phi. Jaromir Jagr, Pit. 1994 Sergei Fedorov, Det. Dominik Hasek, Buf. 1993 Mario Lemieux, Pit. Doug Gilmour, Tor. 1992 Mark Messier, NYR Patrick Roy, Mtl. 1991 Brett Hull, St.L Wayne Gretzky, L.A.
Blackhawks left wing Artemi Panarin has won the Calder Memorial Trophy, awarded “to the player selected as the most proficient in his first year of competition in the National Hockey League,” as selected by the Professional Hockey Writers Association. Panarin received votes on all 150 ballots and was the top choice on 88 for 1,258 voting points, ahead of Shayne Gostisbehere of the Philadelphia Flyers (955) and Connor McDavid of the Edmonton Oilers (858). Panarin, who signed with the Blackhawks in May 2015, led all rookies in goals (30), assists (47), points (77), power-play goals (t-8), power-play points (24) and game-winning goals (7) while skating in 80 contests. He became the fourth rookie in franchise history to reach the 30-goal milestone and the first to do so since 1995-96 (Eric Daze). That included his first career hat trick Feb. 17 at NYR, the first by any Blackhawks rookie since 2002-03 (Tyler Arnason). Panarin is the first Blackhawks player to win the Calder Trophy since linemate Patrick Kane in 2008. Year Winner Runner-up 2016 Artemi Panarin, Chi. S. Gostisbehere, Phi. 2015 Aaron Ekblad, Fla. Mark Stone, Ott. 2014 Nathan MacKinnon, Col. Ondrej Palat, T.B. 2013 Jonathan Huberdeau, Fla. B. Gallagher, Mtl. 2012 Gabriel Landeskog, Col. R. Nugent-Hopkins, Edm. 2011 Jeff Skinner, Car. Logan Couture, S.J. 2010 Tyler Myers, Buf. Jimmy Howard, Det. 2009 Steve Mason, CBJ Bobby Ryan, Ana 2008 Patrick Kane, Chi. N. Backstrom, Wsh 2007 Evgeni Malkin, Pit. Paul Stastny, Col. 2006 Alex Ovechkin, Wsh. Sidney Crosby, Pit. 2004 Andrew Raycroft, Bos. Michael Ryder, Mtl. 2003 Barret Jackman, St.L Henrik Zetterberg, Det. 2002 Dany Heatley, Atl. Ilya Kovalchuk, Atl. 2001 Evgeni Nabokov, S.J. Brad Richards, T.B. 2000 Scott Gomez, N.J. Brad Stuart, S.J. 1999 Chris Drury, Col. Marian Hossa, Ott. 1998 Sergei Samsonov, Bos. Mattias Ohlund, Van. 1997 Bryan Berard, NYI Jarome Iginla, Cgy. 1996 Daniel Alfredsson, Ott. Eric Daze, Chi. 1995 Peter Forsberg, Que. Jim Carey, Wsh. 1994 Martin Brodeur, N.J. Jason Arnott, Edm. 1993 Teemu Selanne, Wpg. Joe Juneau, Bos. 1992 Pavel Bure, Van. Nicklas Lidstrom, Det. 1991 Ed Belfour, Chi. Sergei Fedorov, Det. 1990 Sergei Makarov, Cgy. Mike Modano, Min. Mon Jan 2, 2017 Blackhawks Blues 12:00 PM At Busch Stadium. 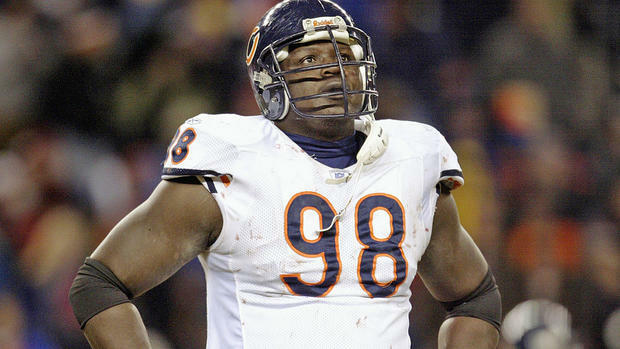 Former Bear Bryan Robinson dies at age 41. Blocked Longwell FG in Green Bay to save win in 1999. Former NFL defensive lineman Bryan Robinson was found dead in Milwaukee on Saturday night. The body of the 41-year-old was discovered in a hotel room just after 10 p.m.Although Robinson died at a relatively young age, the Milwaukee County Medical Examiner’s Office told the Milwaukee Journal-Sentinel that there was no immediate signs of anything being suspicious about the death.Robinson played for five teams over 14 seasons during his impressive NFL career.The former Fresno State Bulldog went undrafted out of college and ended up signing with the Rams in 1997. After only one year in St. Louis, Robinson signed with the Bears, where he made his name as a hard-nosed defensive lineman. The blocked field goal against the Packers came in 1999 and was the highlight of an emotional week for the Bears.Robinson’s improbable block gave the Bears a wild win at Lambeau Field. With just seven seconds left in the game and the Bears clinging to a 14-13 lead, Green Bay’s Ryan Longwell came on the field for a 28-yard field goal attempt that should’ve been an easy chip shot, but wasn’t, thanks to Robinson.Robinson got his hand on the ball to make the block and preserve the win. Former Bears linebacker Lance Briggs was one of many players who took to Twitter to show respect for Robinson.After six seasons with the Bears, Robinson signed with Cincinnati in 2005, where he helped the Bengals end their 15-year playoff drought. Robinson spent three seasons with the Bengals before signing with the Cardinals in 2008.The veteran defensive lineman ended up starting 15 games for the Cardinals in 2008, the year they made their improbable run to Super Bowl XLIII. 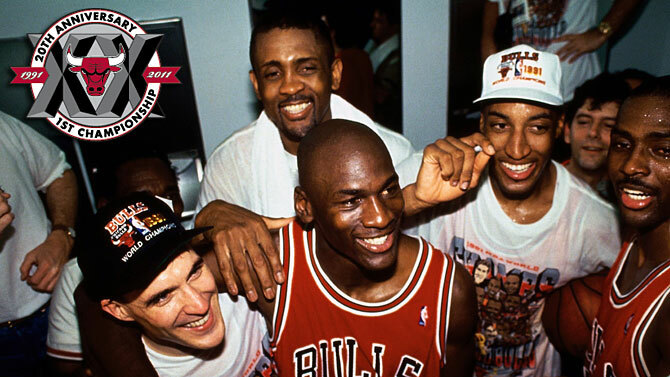 25 Years since Bulls first NBA Title!! 25 years ago Sunday, the Bulls won their first ever NBA Title with a win over the Lakers at the Great Western Forum. Here are the Bulls starters JOHN PAXSON,BILL CARTWRIGHT,MICHAEL JORDAN,SCOTTIE PIPPEN, and HORACE GRANT preparing for the “We’re Going To Disneyland” commercial. Oh, and who the hell is that behind Scottie and Horace!!! (LOL).